Dar-e-Mehr at the Delhi Parsi Anjuman is the only fire temple in the entire Northern belt of India. Its fire was consecrated on 31 December 1961. The history of Parsis (Zorastrians in India) has been of interest and intrigue to many. As per the 2001 census, the Parsi population in India is a little over 70,000. Out of this, about a third are in Mumbai and a much smaller population resides in Delhi. The community is constantly decreasing in number due to several factors, the most prominent of which are emigration, marrying outside the community and low fertility. The failure to accept a non-Parsi spouse into the Parsi community is the most common reason. Atrophy in the community is a major cause of concern for its community members as one-third of the Parsi population are over the age of 60. 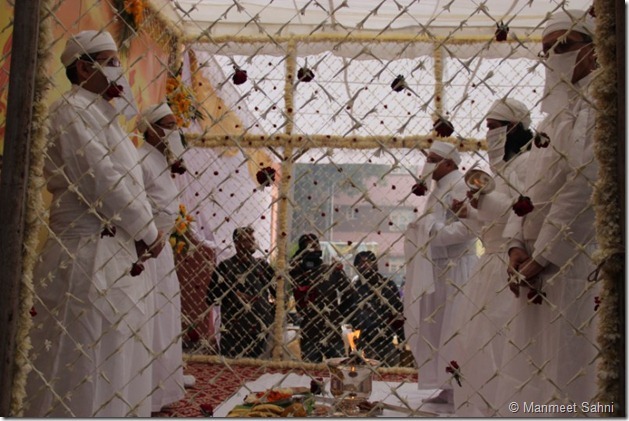 Recently, Dar-e-Meher celebrated 50 years of consecration of its holy fire. It was held at the Delhi Parsi Anjuman and saw Parsi dignitaries, ‘Vada-Dasturjis’ – high priests – and scholars from all over the world taking part in the Grande affaire. The Golden Anniversary of the consecration of ‘Padshah Saheb’ (Holy Fire) was a milestone event for the Parsis and on this auspicious occasion a ‘Maha Jashn’ (Grand Celebration) was organized for the entire community. The cultural and religious amalgam was enriched with sumptuous Parsi delicacies. The Parsis have a long history, there are enthralling ‘quissaz’ (incidental tales) pertaining to their settlement in the Indian subcontinent. One of the most prominent is the ‘Quissa-i-Sanjan’ which the Parsis have religiously endorsed as their tale of forbearance. It charts their historic lineage in India. Qissa-i-Sanjan, the epic poem which is believed to originate in the Greater Khorasan (a historic region in Greater Iran and is mentioned in the ancient accounts of Sassanid Empire) is a travelogue entailing the travels of Zoroastrian emigrants to the western shores of India (Gujarat). Soon after the Zoroastrians escaped the barbaric holds of the Islamic invaders and the Sassanian king Yazdegard, the first Fire Temple was consecrated at Sanjan (Gujarat) in 790 A.D. Qissa-i-Sanjan which is written heavily in verbose style, a typical feature of Parsian verse was authored by a Parsi priest Bahman Kaikobad Hamjiar Sanjana. The Fire Temple of the Parsi community can be classified into three types: Atash Behram, Atash Adarn, Agiari or Dar-e-Mehr and the Atash Dadgah or the household fire found in most of Parsi homes. The Delhi Fire Temple is the Dar-e-Mehr or the Agiari. Dar-e-Mehr in Delhi is situated in the heart of the city; the premises are surrounded by plush greens and remain hidden from the public glare. On an early winter morning, as I walked down the gates of the Fire Temple, I saw beam of golden rays inaugurate the beautiful dawn prayer of ‘Hosh-e-Baam’. The sanctimonious prayer worded ‘through Asha (hope) most high, Asha (hope) most pure’ rendered a serene fervor to the place. Standing near the temple premise, the bright rows of white, golden and saffron flowers embellished the walls of the temple. The view was divine and magnificent. There were also Parsi ‘chokras’ and ‘chokris’ who stood chattering among themselves. The aunties and uncles in effervescent celebratory moods were clad in traditional costumes. The traditional hand-crafted Parsi weaves looked majestic sitting on display. Shiny metal broaches, silver and golden pendants of ‘Faravahar’ (affiliated to the Parsi guardian angel-Fravashi) adorned many. One of my Parsi friends standing next to me whispered, “You are going to be part of our history! It is the first time that the Parsi prayers are being performed out in the open for the Non-Parsis to be a part of them.” It was a revelatory moment for me to see the Parsi priests standing on an elevated platform to perform their liturgical ceremonies. The reading from the Holy Scriptures and performances of the rituals circumscribing the holy fire was a sight of sheer beauty and joy. The holy fire burnt with élan while the vessel in which it burnt mirrored the performing priests. The event marked a new episode in the lives of the Delhi Parsis. The non-Parsi spouses were the star attraction in this historic religious event. It was an attempt to include the excluded from the community and make them feel at home, a part of the commune. This event was a significant move to cut through the age-old customs and adapt to the present times. During the course of the event, it became clear that at the heart of the debate was whether or not to adapt to the changing times, or how feasible it would be to include the ‘excluded’ Non-Parsi spouse. The elderly scholars from Iran, ‘Vada-Dasturjis’ (high priests), vividly expressed their take on the matter. There were arguments and counter-arguments to the debate. Also expressed, radical thoughts whether women priests should be introduced into the Fire Temple and should Parsi priests be involved in administrative affairs formed part of the discussion. There were concerns raised and thoughts shared about helping the economically trodden section of the community and society at large, and treatment levied on people working at the tower of silence. Being the assistant editor of the annual golden celebratory issue of ‘Deepanjali’, a Parsi magazine, I got a rare opportunity to have a proximate interaction with the people from the community. “Parsis are a close-knit community” remarked Mrs. Dhun Bagli, manager of the Delhi Parsi Anjuman. “It is tragic that the community is on a steady decline, but the rules set by our ancestors need to be respected”. Novy Kapadia, grandson to the first president of the Delhi Parsi Anjuman clarifies, “In a global society where more and more Parsis are emigrating, how can one control the community members and make them adhere to the age-old rules? It is important to advocate freedom of choice and to respect the same.” It is evident that the younger generation is quite unhappy with the systematic orthodoxy practiced and prescribed by a certain section of myopic religious visionaries in India and elsewhere, mostly by the Mumbai tribe of Parsis. This old-world rule is being widely challenged and criticized as more and more Parsis are opting for inter-cultural marriage these days. Seventy-three year old Mrs. Ava Khullar, trustee of the Delhi Parsi Anjuman, is married to a Hindu. She forcefully pointed out, “Our community is disappearing from the face of earth.” How long would we hold onto the obscure belief of self-preservation and intermarriage leading to a dilution of faith and weakening of cultural bonds? Dadi Mistry, President, Delhi Parsi Anjuman expressed his eagerness to involve the Parsi youth in the affairs of the community. “Community building should come through the younger generation. They should feel responsible to carry forward the Parsi ways and I feel that with changing times, we should be open to change and adapt where necessary. There are so many things that one should be concerned about, like the preservation of the historical documents and issues pertaining to ‘Para-mobed’ (temporary priest).” The priesthood in the community is more or less inheritance based, but of late, the trend is changing. The community is now facing a dearth of priests as the younger lot prefers to pursue occupations other than becoming a priest. The meager amount paid for the priestly ‘duties’ is one significant reason driving the Parsi priests out of their current occupation, along with other occupational hazards like long hours of standing near the smoke and fire. Para-Mobeds (trained priests who perform the daily rituals at the temple) are now coming to the fore. A proper training is given to ensure the priestly rites are performed in accordance to the norms of the temples.